Soya balls gravy or the meal maker gravy is a tempting and delicious side dish for the roti or chappathi. Soya balls or meal maker is rich in protein and good for health too. 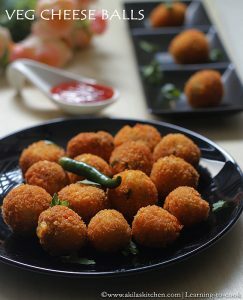 Those who do not eat non veg, go for this soya balls. Will update with step wise pictures soon. Wash the soya balls and soak in water for 10 to 15 minutes. Squeeze out the water fully and keep aside. Now grind the tomato and onion to a paste in a mixie or food processor and make it to a coarse paste. In a pan, add oil and above mentioned spices and fry for a minute. Now add in the grinded paste, ginger garlic paste and saute well, till the raw smell of onion and ginger garlic goes off. After that add in all the powders except garam masala. Now add the soya balls, salt and garam masala and allow to cook. If gravy becomes very thick, add little amount of water. When the oil starts floating on the top, switch off the stove and garnish with coriander leaves. Serve hot with any chappathi or roti or nan. Thanks a lot for linking to my Event!! This looks just so good and delicious! Btw,forgot to tell you,regarding your doubt ,The microwave brownies can be made in a convection oven .But I am not sure of the timings as I don't have one.You can check DK's blog[www.chefinyou.com] for the timings,she has these recipes.Hope it helps..
Yumm! have a great year ahead Akila–Loads of wishes n cheers ur way ! Wishing u a happy and prosperous new year to u and ur family..so inviting gravy..
my favourite dish and it looks perfect..yummy..
Nice gravy! Looks really delicious and healthy! never tried this before… this looks good.. Very healthy and tasty recipe. wow, loving it. When you soya balls, do you mean those soya chunks that come in the brand of nutrella or rani or something like that? Looks so tempting….loved the recipe…. Such a tasty looking dish with a wonderful and rich gravy. Healthy dish! Happy New Year 2011!